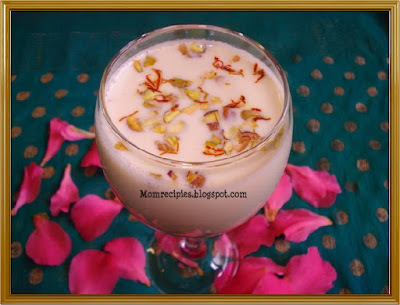 Thandai is a wonderful cold refreshing and healthy flavored milk that is traditionally prepared during the Holi festival (festival of colors). When people become a little exhausted after playing exciting yet tiresome holi a glass of Thandai offers instant energy and cools the body. Blanched Melon Seeds( Magaz) - 1 tbsp. Whole Fat Milk – 500 ml. Fennel Seeds (Saunf) – ½ tsp. 1) Heat the milk ,then add sugar. 2) Stir it till sugar dissolves completely and remove from flame. 4) Allow the milk to cool to room temperature. 5) Blend almonds, melon seeds, Soaked poppy seeds to a smooth paste. 6) Grind the fennel seeds, pepper corns and cardamom into fine powder. 7) Add the powder ,paste to the boiled milk.Mix well. 8) Refrigrate it for 2-3 hours.This allows the flavours to infuse into the milk. 9) Strain the mixture through a fine sieve and discard the solids. 10) Add rose water and Mix well. 11) Serve Chilled after granishing with Silvered pistachios and saffron strands. 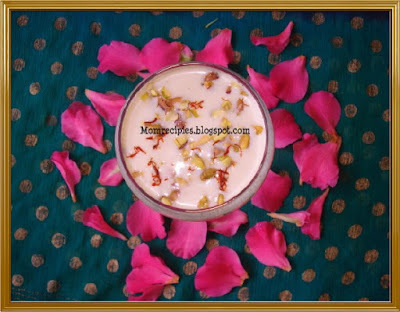 Tip:- You can also use 1/4 cup dried or fresh rose petals or gulkand variety rose petals too. Love the milk. Happy Holi. Thanks. 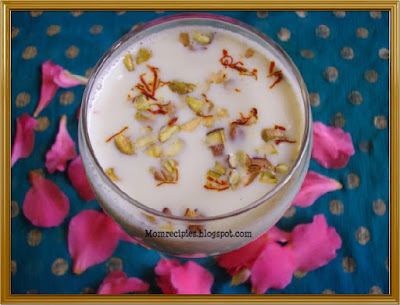 We tried your recipe this holi and thandai was a hit. Thanks for sharing and making it easy. That looks so yummy and I'm so tempted to try some. Can I? *wink. Thanks for sharing recipes. My warmest holi wishes and greetings to you!